Humans learn through observing behavior from others. They watch and emulate the behaviors they see, making adjustments to their own actions along the way, given feedback. The same technique can be used in autonomous vehicles to model driving behavior based on direct observation of human driving. This technique is known as behavioral cloning. I created a software suite to implement behavioral cloning for generating autonomous vehicle steering control. Using a front-facing video stream of safe driving paired with steering angles as training data, I built a convolutional neural network and trained it (using Keras) to clone driving behavior. 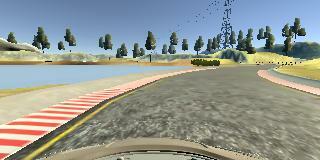 Given a set of three front-facing camera images (front, left, and right), the model outputs a target steering wheel command. All of the code and resources used in this project are available in my Github repository. Enjoy! 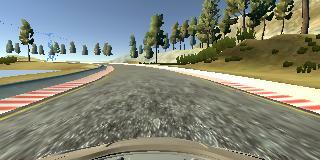 Will train a model to drive the vehicle in the simulator. Note: There is a known local system setting issue with replacing “,” with “.” when using drive.py. When this happens it can make predicted steering values clipped to max/min values. If this occurs, a known fix for this is to set the environment variable LANG to en_US.utf8. 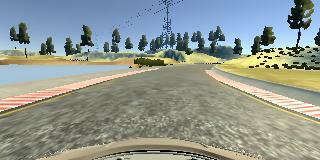 Will create a video of the simulated vehicle driving with the model. The output will be a file called run1.mp4. Will run the video at 48 FPS. The default FPS is 60. The overall strategy for building the software’s neural network was to start with a well-known and high-performance network, and tune it for this particular steering angle prediction task. This system includes a convolutional neural network model similar to the published NVidia architecture used for their self-driving car efforts, given that this system is attempting to solve the exact same problem (steering angle command prediction) and NVidia’s network is state of the art. This network inputs 160×320 RGB images from multiple camera angles at the front of a vehicle and outputs a single steering wheel angle command. One convolutional and one fully connected layer were removed from the NVidia architecture to reduce memory processing costs during training. Before the convolutional layers of the model, a cropping layer removes the top (including sky) and bottom (including car image), to reduce noise in training. An additional layer normalizes the data points to have zero mean and a low standard deviation. In between the convolutional layers, RELU activations are included to introduce non-linearity, max pooling to reduce overfitting and computatational complexity, and 50% dropout during training (also to reduce overfitting). In between the fully-connected layers of the model, RELU activations are also introduced. The input images are cropped to remove the top 50 and bottom 20 pixels to reduce noise in the image which are likely to be uncorrelated with steering commands. Each pixel color value in the image is then normalized to [-0.5,0.5]. To augment the data set, I also flipped images and angles during training to further generalize the model. After the collection process, I had 8253 data image frames, each including center, left, and right images for a total of 24759. During training, the entire image data set is shuffled, with 80% of the images being used for training and 20% used for validation. I configured the Keras training to use an early stopping condition based on knee-finding using the validation loss, with a patience of 2 epochs. Also, an Adam optimizer is used so that manually training the learning rate is not necessary. 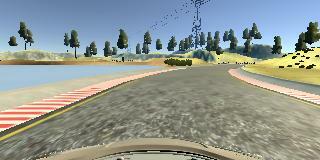 The simulated vehicle drives around the entire track without any unsafe driving behavior; in only one spot did the simulated vehicle get close to running of the track on a curve (but did not leave the driving surface, pop up on legdes, or roll over any unsafe surfaces).